Eventr, a Event Registration Plugin for WordPress lets you use your blog as an event management tool. You can create an event - the plugin will let people register for the event - it can also show a list of all the attendees. Once the event is done, you can deactivate the event and no more sign ups will be allowed. Set an event date - registration will stop after that date. Set maximum attendee limit for event. Registration will stop after that limit is reached. Download the zipped file from the Eventr page in Wordpress Plugin Repository. 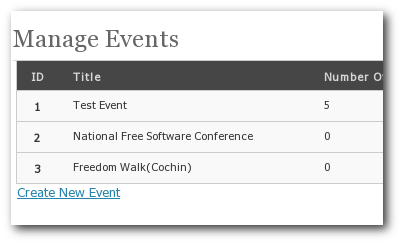 Go to the Events Management page(Tools > Manage Events) to create or edit events. I have set up a forum called Eventr WordPress Plugin. Please use that to post your questions.